News, Polynesia, Tonga » Why China is interested in Tonga? Why China is interested in Tonga? The government of Tonga in the South Pacific has recently accepted a large gift from China - a turbo-prop aircraft for the kingdom's new domestic airline. But the present has stirred up concerns about China's growing role in the archipelago once known as the Friendly Islands. 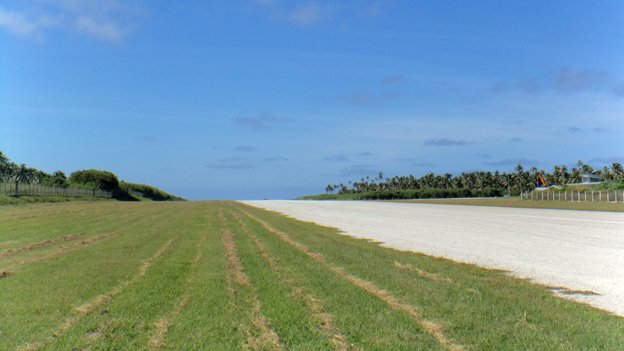 The domestic airport in Tonga's capital, Nuku'alofa, was eerily quiet. The friendly cafe, where three years ago I'd enjoyed the delicious locally-grown coffee, had gone. And there was no sign of my plane. Waiting with me in the shade for something to happen was a young Chinese man, booked on the same flight, returning to his wife and grocery store on the island of Hapa'ai. We started chatting and during our long wait I learned quite a bit about Johnny Wang. How he came to Tonga from Shanghai, and his two young children stay there with his mother-in-law. He sends remittances and visits them during Chinese New Year. How he enjoys his new life on Hapa'ai. "Very quiet, very peaceful," he says, "and easier to make money than in China." We started talking Tongan airline politics. How the Chinese government's gift of a new passenger plane for inter-island flights had prompted the New Zealand-based company that had been providing a domestic air service to pull out, saying it couldn't compete with a subsidised airline. The Chinese-manufactured MA60 aircraft has been delivered. But no Western government has given it a safety certificate and New Zealand has just announced it's suspending a multi-million dollar aid package to improve tourist infrastructure in Tonga until these safety concerns are resolved.As the whale-watching season gets under way on outlying islands such as Hapa'ai and Vava'au, the flights fiasco is playing havoc with the tourist economy. It's also stirred up concerns among some Tongans that Chinese aid - generous, visible and impressive as it's been in recent years - can be a mixed blessing. They describe urban roads laid without proper drainage so nearby houses get flooded when it rains, and grandiose public buildings, poorly adapted to a tropical, oceanic climate, that are costly to keep cool and maintain. Cabinet minister Clive Edwards chose his words carefully. "Some of the buildings they've put up", he told me, "are a disappointment". I was sitting with him in his office in the Ministry of Justice. "Including this one?" I asked. He laughed, a deep Tongan guttural laugh.On islands across the Pacific, you'll find very visible evidence of Chinese "big-project" aid: sports stadiums and parliament buildings, government offices, police stations.It's their fish, potential mineral resources and votes in the UN that make these small Pacific nations of growing interest to Beijing. In Tonga, China's visibility is all the greater because of the several thousand-strong Chinese minority. There is a degree of tension between the two communities. From Tongans you hear phrases like, "the Chinese are bad drivers" and "the Chinese are everywhere". What is not in doubt, though, is the key role the Chinese play in the business sector, especially in the little family-run grocery stores, the Fale-Kaloas, as they're called. The Tongan extended family runs on the principle, "to each according to his need, from each according to his capacity". But if you're a Tongan trying to run a Fale-Kaloa and a relative turns up to say his grandfather's died, there's going to be a feast and you're going to have to give me all the chicken in your shop, you're not going to last longThe plane did finally get me to Hapa'ai and a day later I'm cycling across a causeway between two small islands. There's repair work going on and a Chinese foreman in charge. I hear an engine revving behind me and a delivery van rumbles past. I note how clean and new it looks, compared with most vehicles on the island. It stops on the other side of the causeway and a head leans out of the front window and grins at me. It's Johnny Wang, my companion from the plane. I am delighted to see him, and his pale, smiling face suddenly looks so exotic on that lush green atoll beside the clear blue sea.Then I remember I need some toothpaste and some new batteries for my torch and I realise that I am reassured by Mr Wang's presence. I know he'll have what I want. Twenty minutes later I am inside his shop. It's an emporium compared with the local competition - tools, footballs, rice, tinned food, nappies. And if he is asked for something he hasn't got, he says he'll try to get it. As I cycled back with my toothpaste and batteries, I realised that whatever the future role of the Chinese state in Tonga, the niche Mr Wang is filling on Hapa'ai will be his to occupy for a long time.